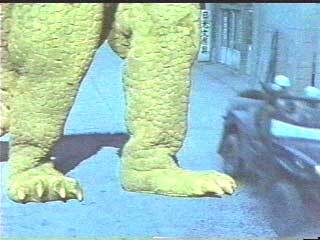 After the success of Daiei's Godzilla rip-off, Gamera, is it surprising that other studios would want to get in on the city-stomping action? 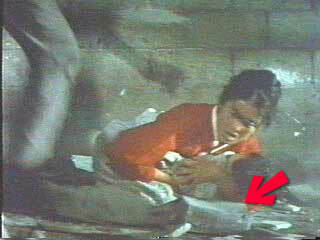 We've covered Giant Monster Gamera, and Nikkatsu's entry in the genre, Gappa, the Triphibian Monster. Now we bring you the Japanese/South Korean co-production, Yongary, Monster from the Deep. Set in Korea, Yongary introduces us to a bunch of characters whom we will follow throughout the movie, but thanks to the English dubbing job, we never learn their names. 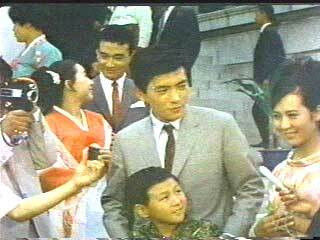 The film opens directly after the wedding of two characters (the bride is On-na, but we never figured out the groom's name), who drive away from the ceremony wondering what happened to the On-na's little scamp of a brother, Icho. Suddenly, the bride and groom begin itching wildly! And they aren't even in bed yet! He's evil! Evil I tell you, pure evil! Ilo: Don't you realize they almost scratched themselves to death? Icho: Yeah, but you gotta admit it was kinda funny. Ilo: Yes, Icho, I guess it was. "It's true, gentlemen. We are there." Later that night, the bride and groom adjourn to their wedding bed. The resulting scene reveals that the two are about as comfortable being alone with each other as Ned Beatty and Bill McKinney. Boy, it really makes us rethink that planned purchase of a Korean mail-order bride. Fortunately for everyone involved, the wedding night ritual is interrupted by a phone call from the groom's boss. Korea's space program needs the newly-married man, who is apparently Korea's only qualified astronaut, to blast off into space. The flight is a surveillance mission, and while flying over "the Middle East," some sort of disturbance is spotted. We understand that this is actually supposed to be a nuclear weapons test in China, but the dubbing really confuses the issue. Soon an earthquake with a moving epicenter is heading for "the city," which we assume to be Seoul. In a scene that presages a similar plot twist in Deep Impact, the first person to obtain photographic proof that a giant monster is moving underground has an inexplicable car accident. Luckily, he lives and the authorities find out that a monster is coming to eat Korea's lunch. "Faster! Oprah is catching up!" The reptilian monster is dubbed Yongary (after a Korean legend, of course), and it emerges from the ground to begin a more traditional stomp 'n' stumble through the Korean countryside. The might of Korea's H/O scale military is arrayed against the monster, to no avail. 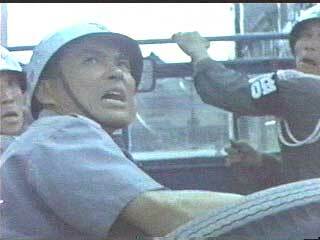 One would think that after the rampages of Godzilla, Gamera, and Gappa, national governments would realize the futility of tanks and such against giant monsters, but the Koreans dutifully send their miniature army against the enormous foe. Tiny, mechanized mass slaughter is the result. 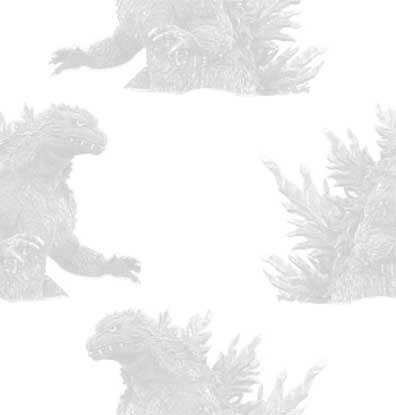 Scenes follow showing us the sociological impact of a giant monster attack. One group of hedonistic business types gorges themselves in a restaurant, awaiting the end. As with many Asian films of the period, kids are portrayed as being incapable of dealing with a crisis, so there are shots of dance parties and heavy drinking by teenagers who refuse to get out of the monster's path. Meanwhile, hordes of responsible (read older) citizens evacuate Seoul on foot carrying their prized possessions with them. We noticed that for some of the evacuees, their most prized possessions included end tables and buckets. This was obviously before Korea's economic boom. Yongary rampages through Seoul. Ilo runs into town to see the monster because, "Nobody knows what to do this time, neither the generals or the so-called politicians." Dang, we hate it when "so-called" politicians take over, don't you? Where Ilo goes, Icho follows, and pretty soon Su-na is running through the streets yelling, "Icho! Ilo!" over and over again. Su-na finds a wounded Ilo, but Icho is nowhere to be found. to do special effects anymore. In fact, Icho is bucking for Kenny status. 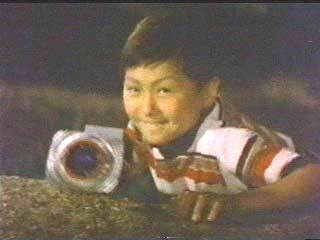 If you're familiar with the Gamera series of films, there was usually a kid in short pants, often named Kenny, who would be the supreme source of information on the monster. Kenny would also have unlimited access to all levels of political and military power, allowing him to mix freely with those in a position to take action against the monster, once they had the benefit of his prepubescent wisdom. In any case, Icho follows Yongary around, and observes Yongary eating flames. Icho also sees that a certain chemical related to ammonium irritates Yongary. The next day Icho gives this information to Ilo, who prepares a helicopter loaded with a chemical he hopes will kill Yongary. That night, the military attacks Yongary with missiles, and at the same time Ilo drops the ammonium on Yongary. The monster apparently goes into a coma. But that night, Icho, afraid that he won't get a chance to be a Kenny, sneaks out and zaps Yongary with the light ray thingamajiggy. This has two effects: Yongary wakes up and begins dancing to what sounds like a Korean surf rock tune. Yes, you read that right, Yongary cuts a rug -- and doggonit, if we had a server that could handle the strain, we would have a quicktime movie of it for you. But alas, you'll have to wait for Andrew over at badmovies.org to work his way around to this movie. The second effect of Icho's little prank with the itching ray is that Yongary now has a beam weapon that he can shoot from his nose horn. Inconveniently placed, to be sure, but you can bet his sinuses are clear. Yongary, Monster from the Deep is quite similar to the previous year's Giant Monster Gamera. Both films feature monsters that emerge from the ground after a nuclear explosion, eat flame, and are susceptible to cold. Both films also feature a shorts-wearing, know-it-all kid who eventually shows affection for the monster, though Yongary goes the extra step of making Icho the engineer of the monster's downfall. It's a tough lesson for an eight year-old kid to learn: your new kaiju friend will probably be the inadvertent cause of thousands of deaths, and so his rampage must be stopped -- in other words, it's time to take Ol' Yongary to the vet. Whatever goodwill the movie might have engendered in you thus far it will probably destroy during the finale. 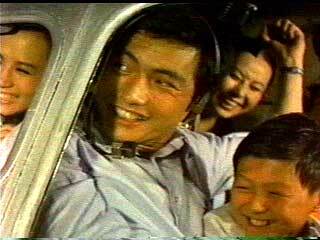 Ilo finally comes up with the chemical that will put Yongary down for good, so everybody crowds into the helicopter. What a great family outing! 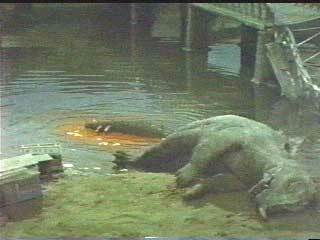 Finding the target bathing leisurely in a river, Ilo drops the poison on the giant saurian. Yongary topples over, and twitches pitifully in the river, gasping for life as his blood seeps into the river. We've long been looking for an excuse to use the term "rectal bleeding" in a review, and Yongary has supplied it. The film ends as it should, with everyone standing around, looking collectively relieved. The End. Whew, it's been a long time since we've given a film the full plot synopsis treatment, but given the obvious interest we have in the subject matter, and the relative scarcity of Yongary on tape, we thought it appropriate to cover the film as a whole and give the full picture to those of you unable (or unwilling) to see it for yourselves. 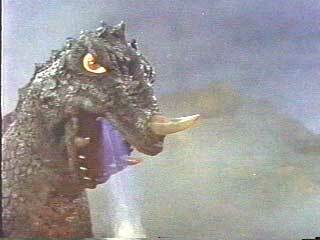 On the plus side, Yongary is one of the better Godzilla-inspired rip-offs. The suit has some impressive detailing, like the four tail spikes, and the suit looks more impressive than those that would show up in the majority of the Gamera films. While the effects are rarely very realistic, there are a lot of them, with probably more city destruction than would show up in any of the original Godzilla movies made after this point. It's also evident that the rampage scenes were shot in the context of a script, unlike some other giant monster movies we could name. Unfortunately, there are also some really embarrassing special effects. 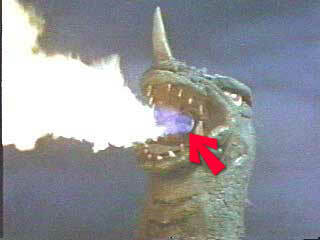 In several shots the nozzle that allows Yongary's head to shoot flame is clearly visible. When Yongary's destructive behavior drops bricks on people, it is obvious that the bricks are shoeboxes that have been painted to look like bricks. 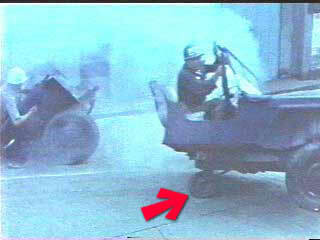 And our favorite is the scene in which Yongary uses his beam weapon to cut a moving jeep in half. A fifth wheel is clearly visible beneath one of the halves, allowing it to continue rolling. Yongary's worst offense as a monster is his roar: it sounds like a donkey. No fooling. "Eeeee-awwwwww!" 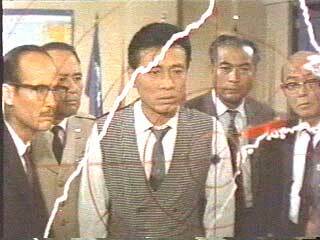 And during the entire flick, the only time it changes in pitch or inflection is when Yongary finally kicks the bucket. So for the rest of the movie, it's the same canned "Eeeeee-awwwww!" every time. Icho: You know, dropping a chemical strong enough to kill a huge animal into a river may have grave consequences to the local ecosystem. It could also get into the water table and poison wells and, in the long-term, cause everything from cancer to birth defects. "It's fun to watch the monster die bloody!" Korean Prime Minister: Are you sure that's a good idea? In general we aren't big fans of "where are they now" style end credits, but this is one movie in which we could have used them. We were so attached to these characters, especially the astronaut guy whose name we never learn, that it would have been nice to catch up to these characters later in life. At the end of the film Ilo promises to marry Su-na, but can their love survive after Ilo meets his new lab assistant, Lay-da? Which will it be, Ilo: Su-na or Lay-da? And we would really hate to miss watching Icho rob his first convenience store. We go through a lot for you people. We hope you realize that. And we have no idea how to spell the names we did learn. So all spellings are speculative on our part. Go back!